For years, I felt as though the spiritual New Age was missing some vital pieces. As a movement, as a practice, it wasn’t working for me. As a soul-based psychotherapist I saw the frustration on the faces of those I worked with when they did all the things they knew to manifest and create their lives according to the principles they’d read or been taught, and still ended up with unsatisfying results. "What am I doing wrong?" they’d ask in frustration. I’d tell them about the sacred guidance of Sage, because for years Sage had been gently speaking to me about the evolution beyond the New Age. After years of sampling and healing and believing, what was missing from the New Age spiritual understandings was the full integration of it all. The Soul Age, Sage explained, took into consideration that you were a physical, emotional, mental, and spiritual human being. You can't live the principles of manifestation when you’re coming from your ego-only desires for a new this or new that. You can't accept and work with the people and situations and conditions of your life when you don't understand them in their wholeness, their ‘multi-dimensionalness’. You can't create the life you came here to live until you expand your understanding and application of living as soul in physical form. None of this is taught in the spiritual New Age, and it can't be done in one sweeping spiritual psychotherapy session, either. It's a process. A way of life. The next level of living, actually. A path, a direction, a movement. If the principles of the New Age Movement aren't working for you, aren't helping you integrate the concepts into your everyday life, it's likely because you’ve kept evolving, and the principles are outdated for the current energetics and the path your soul is creating with you. You are taking the next step beyond the combination of the Information Age and the New Age. You are creating the next stage of your evolution. Years ago, Sage and I termed the fusion, the Soul Age. It represents the energy of the times and the energy I help clients, program participants, and readers, tap into on a daily basis. When you look around you there's evidence in grassroots movements, community collectives, whole-thinking strategies, and organically remembering and living who you really are. Whether you connect to, and live the Soul Age in your yoga class, your local farm to table food co-op, or in your choice of alternative vehicle and home, the Soul Age is living true to your whole self. Every single day. Is about personal accountability and global responsibility. Is about challenging the old order by living beyond your perceived limitations and restrictions. Is the era of empowerment, the 'We are in this together' anthem, but not just as a human, as a multidimensional being. Is consciously redefining your focus, purpose, and remembering your past, so you can create your future. Is much bigger than your individuated self, and yet your individuated self will benefit from it all. Is representing the legacy on the planet Earth going forward. In the Soul Age, you are taking the physical and spiritual and entwining them together, allowing this integration to come to the wholeness of their origin. That’s why the sacred guidance of Sage has been bringing through these visionary messages. They give you the foundational understandings of what happens after the spiritual New Age. Where do you go from here? What does that mean? What does it not look like? How do you do it? If you're as unsatisfied with your life or the spiritual New Age attempts you have tried to 'make it better', there’s nothing wrong with you. The understandings, the pieces that were missing, are found in the next stage of evolution. Over the years I have been equally amazed and frustrated by the spiritual New Age. That’s because it wasn't enough. I could sense there was more. I felt it was only the tip of the iceberg. And then people started shrinking it even more. Diluting it. Making it smaller and less meaningful. Condensing it into sound bytes and trends. Every part of me screamed, "No! Make it more, not less!" I wanted to understand how to apply the spiritual New Age insights and knowledge into my human life. The insights I was exposed to were so amazing, and I knew life could be more amazing, so how could I marry the two together? The sacred guidance of Sage has been priming me for the Soul Age from the moment they formally came through in 1996. At first, channelling Sage seemed to be New Age, but they never ever let it go in that limiting direction. Sage’s messages have always been about empowering the human to live as soul while in physical form. To integrate, rather than separate, the human and soul. In the New Age understandings, we hear about soul, we talk about soul, we somehow believe that if we do this, this, and this, we are "spiritual", and that's the same thing as living as soul. But, of course, it's not. It's the current over simplification of the whole understanding. The truth. The soul. The integration. I remember the day I put the connection of Sage and Soul Age together. Brain epiphany. It all came together in one huge synchronistic moment. The spiritual New Age gave you unlimited understandings of the power beyond the traditional three-dimensional-only ways of thinking and doing life. In the Soul Age, you take those understandings and consistently develop, apply, and integrate them into your human realities. 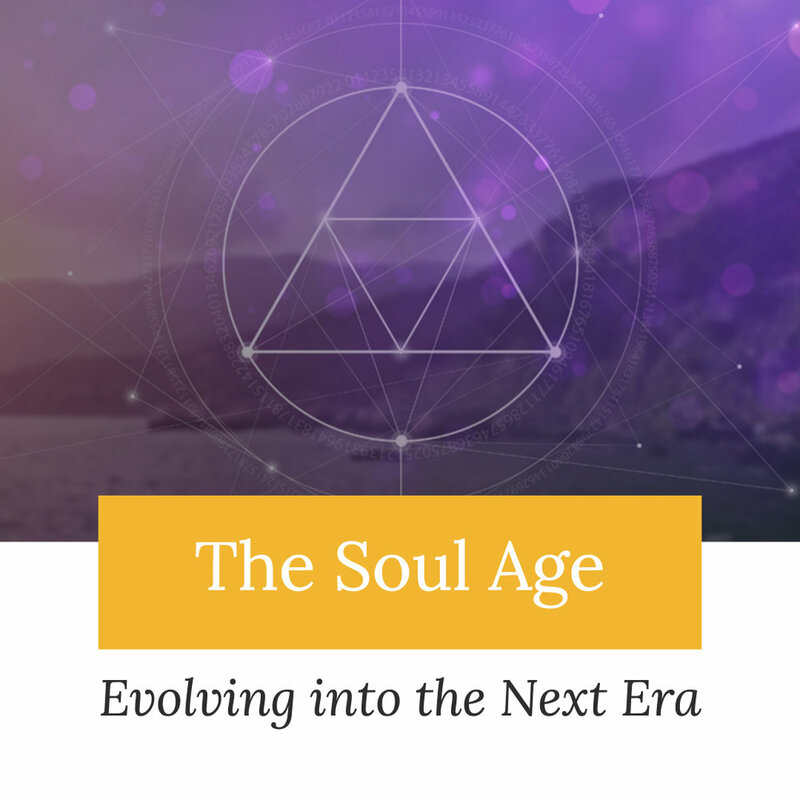 If you're ready to keep evolving, then the principles and protocols of the Soul Age is what you want to understand and apply, now. What does it look like? What can you do? Sage has gifted us with wisdom for the ages. I've transcribed the messages for you so you can download them or read them from here to align with the whole understandings of the Soul Age. And it's FREE. #5 - WHAT IS THE SOUL AGE? Want more Jonni+Sage universal truth teachings? Now you can have FULL access to previous offered courses and do them in your own time. No time limit for completion. To get the most out of these courses, I've created a FREE downloadable self-directed program you can do anytime. 20 mini-meditations and a 92-page ebook give you all you need to deepen your connection to the sacred messaging I bring through.